BASSETERRE, St.Kitts– A well-known artiste promoter and booking agent Lexi Brooks of VIP Connected continues to make good on her adoption of the Dieppe Bay Primary School following a renewed gesture of her longstanding commitment this week. On the morning of Wednesday 21st June, she journeyed to the school having arrived on the island the day before for official St. Kitts Music Festival business, bringing scholastic items for students and teachers alike. Brooks, who currently resides in New York, originally hails from Jamaica. Pencil cases, crayons, erasers, pens, dusters and rulers were among the goods presented during a brief presentation ceremony conducted at the school’s compound located in the rural community of Dieppe Bay. Additionally, Brookes presented a cheque to Principal Jacqueline Douglas for the school to host a pizza party before closing for summer break. This made the children cheer with excitement. 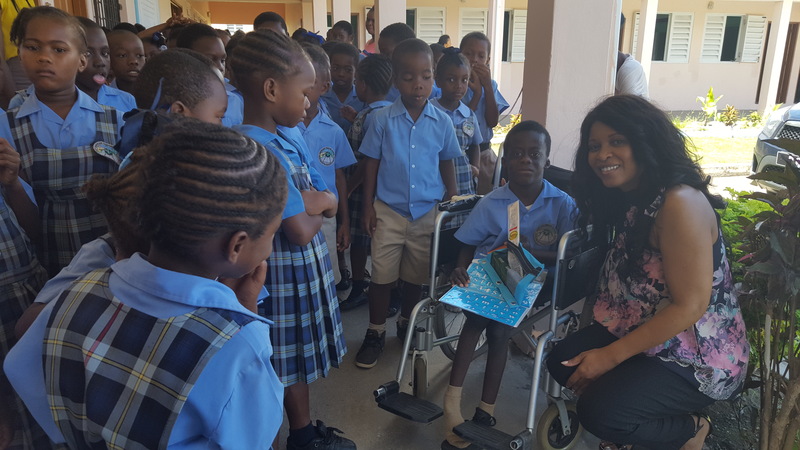 The first student presentation went to wheel chair bound student Kronje Warner of grade 2 who received a pencil case of academic goodies as Brooks applauded him for being attentive and well-behaved during the ceremony. Brooks interacted with the youngsters in playing fun quiz games and awarded items to winners and participants. There was Music Festival quiz, asking students to name three artistes performing at this year’s festival. Grade 4 student Xavier Wilkinson correctly answered listing Scratch Bamma from St.Kitts as one of the acts. She also gave assurance that the school will work harder with the students so as to achieve excellence. In speaking with the media, Brooks gave some insight as to how she came about adopting that learning institution over seven years ago.